Do you remember ABC’s Wide World of Sports? You know, “The thrill of victory! And the agony… of defeat…” If you do, here’s a bit of trivia: the ski jumper they always showed wiping out during the “Agony of Defeat” bit of the intro is Vinko Bogataj from Slovenia. Although the crash looks extremely rough, Bogataj walked away with just a mild concussion. That’s lucky: he could have suffered some major sports injuries to his feet and ankles! 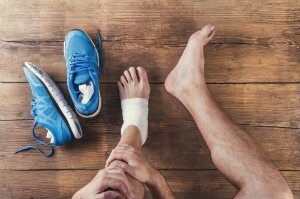 Ankle Sprains – A common injury among the sporting and non-sporting alike, a sprain happens when the ligaments of the ankle are stretched or twisted beyond their normal limits. This can cause partial or even full tearing of the tissue. Stress Fractures – These are tiny cracks that develop along the surfaces of bones, often in the heel and midfoot. They most frequently occur as a result of overuse, or simply trying to do too much too soon in physical activity. Achilles Tendonitis – Another overuse injury, this condition sees the Achilles tendon (also known as the “heel cord”) develop tiny tears, often due to a sudden increase in repetitive activity. The tendon becomes inflamed, leading to pain anywhere from the heel to below the calf. Care for most sports injuries typically involves rest and treatment to help manage pain, inflammation, and other symptoms. The best ways to prevent them from happening are to properly equip yourself with the right protective footwear for you sport and to condition yourself to activity gradually to give your body opportunity to strengthen itself for what you demand of it. Only in few cases will surgery be needed. If the agony of defeat catches up with you, the doctors at Martin Foot and Ankle are here to provide you the best in sports injury care. Our offices in Hanover, Lancaster, Lititz and York are ready to help; just call (717) 757-3537.